Well, it's been a weekend of running again. Saturday I decided to do my bit again for Alice Holt Parkrun, and became a volunteer. My good friend Paula was Run Director for the day, so I was there for morale support and to enjoy the other side of the run. Last post I saw before setting of for the morning was stating that there would be a window around 9am without rain. True to form, it didn't rain, it snowed!! My task for the morning was to be timekeeper. This appealed to my OCD side! A straight forward task. Press start on the stopwatch at the beginning of the race, press the lap button as each runner came over the finishing line. Simple! Despite the very cold conditions, 98 hardy runners completed the 5k course. Then it was off to enjoy a warming cup of coffee or two. Oh and a big well done to Paula for hosting a great and successful run!! If you haven't done a Parkrun, I really recommend them. Great fun for a Saturday morning and totally free! Also, please volunteer. Running events won't survive without the volunteers. Not just at Parkrun, but all runs and races. 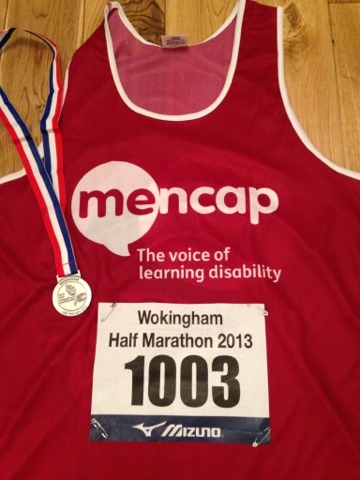 Sunday and the Wokingham Half Marathon. Pulling back the curtains first thing, I hoped to see clear skies and a cold but crisp morning. Unfortunately the weather gods had other ideas! Grey, cold and raining. Oh well, the run of good weather on race days had to come to an end. Today was that day! 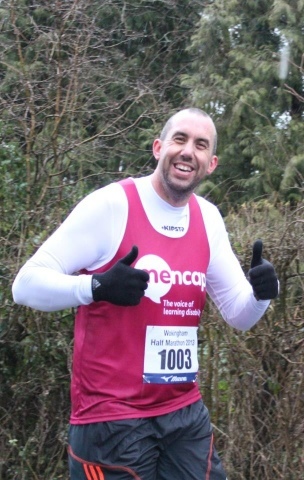 After last weeks ultra, I had no intention of racing this race, instead dedicating the race to help my friend Beccie break the sub 2 hours. I was going to be her pacer!! Things didn't start to well leaving the house though. Half a mile down the road on the way to pick up Beccie, I was annoyed with myself for not picking up an umbrella. Then the little latch in your head that holds back vital information like, "you've left the gas on" or "you forgot to put trousers on again" kicked in. I had forgotten my Garmin! 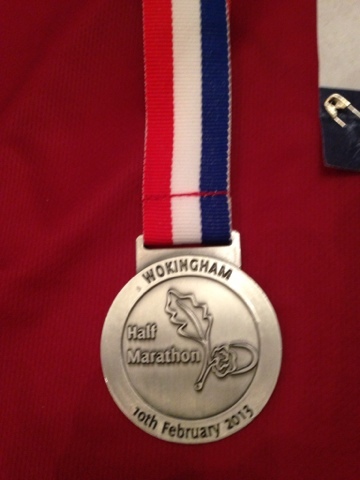 Would be a bit bloody hard pacing without having any idea of pace! So back home I went. Watch gathered and an umbrella too! Now I think I have everything, best get Beccie. Beccie picked up and no more incidents we got to Wokingham and made our way to the race start. Rain hadn't eased up and the race area was on a field, which was starting to resemble Glastonbury. It didn't take us long to find Lisa and Laura. In the massage tent having pre run massages. All quiet until other runners came in to use the area to get out the rain. Poor ladies trying to relax! Eventually the time came to leave our dry safe home and get to the start line. The majority of the 3000 starters all wearing matching black bags! Thankfully we didn't have to wait to long and we were off. Heading out the park and onto the local country roads. A good mix of support in the early first mile and we settled down nicely into our pace. I say our pace, I'm not sure Beccie knew what that was and I had her trust in my hands. I needed to gauge how she was feeling, but I was also concerned that we should be a little above our set pace. Bearing this in mind, I picked the pace up a little, which annoyingly was at the same time as our first hill. Well motorway bridge. Knowing Beccie I knew this wouldn't pose any problems so we dug a little deeper and cruised over. After four miles and another motorway bridge and hill, we had banked a good 75 secs ahead of our ideal pace of 8.55 min/miles. Time to settle in. Beccie was brilliant and trusted me 100%. I suspect she may have muttered a few bad words occasionally under her breathe. But hey, I probably would have too! We stayed settled at our pace until around mile 8 where Beccie started to feel "uncomfortable" as she put it. My reply "good". I'd be more worried if she wasn't uncomfortable! After having a few chats with other runners we had to start to dip deeper. Beccie had the time in hand, now was the time to use it. Occasionally I got a little carried away and had to slow down again, but eventually we were in the last mile and skirting the park where we could see and hear the finish area. As we turned into the park and the last couple of hundred metres I really encouraged Beccie to open the pace. She didn't quite have the legs but crossed the line unofficially in 1hr 57.05!! Nearly four minutes quicker than her PB!! The rain didn't let up all morning so to break a pb plus a sub 2 hours in the conditions we had was just amazing! Unfortunately we were so cold and need to get warm, we didn't get to see Lisa and Laura finish. Although I have heard from Lisa, and believe unofficially she finished around 2 hours 45 with Laura quicker than that. To sum up, a good race slightly spoiled by the weather conditions. I would definitely go back and do it again. Also a thank you to Sara Lambourn cheering out on course and taking pics, shame I didn't see her brother in law, Chris who got a new pb of 1hr 46! !